A group of Republican senators has introduced a bill to give federal prosecutors the option of impaneling a second jury for sentencing in federal death penalty cases where the first jury failed to reach a decision. Sens. Tom Cotton (R., Ark. ), Pat Toomey (R., Penn), John Cornyn (R., Texas), and Ted Cruz (R., Texas) introduced Eric’s Law Wednesday, so named for federal correctional officer Eric Williams who was murdered in 2013 by an inmate serving a life sentence. Because one member of the sentencing jury would not affirm the death penalty, Williams’ killer continued serving life in prison. In a press release, Cotton argued the continued life sentence was a way of receiving no punishment. "It’s disturbing that the man who murdered Officer Williams escaped punishment. 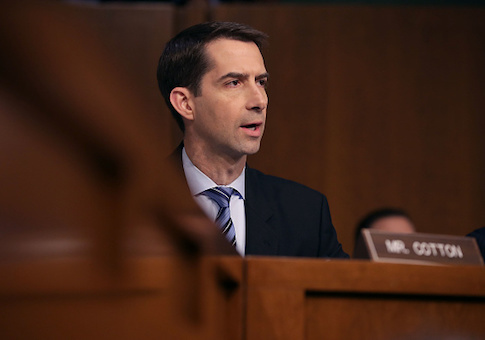 Eric’s Law will protect against such a gross miscarriage of justice and allow more hardened criminals to be prosecuted to the fullest extent of the law," Cotton said. Toomey echoed Cotton’s point and said families should not have to see violent criminals escape justice. "[Williams’] murderer essentially received no punishment for his crime, even though eleven out of twelve jurors voted for the death penalty, because he was already serving a life sentence. The lack of any consequence in this case highlights a flaw in our justice system that this legislation will address," Toomey said in a press release. "I hope my colleagues will swiftly consider this important piece of legislation so no other families have to see violent criminals avoid justice." Current law does not permit federal prosecutors to impanel a second jury for sentencing in death penalty cases. Instead, when a jury is unable to reach a unanimous decision, the judge must choose a punishment besides death. Cornyn argued Eric’s Law is consistent with federal law’s death penalty provision. "Federal law provides for the penalty of death in the most severe crimes, including those involving the vicious murder of law enforcement officers and prison guards like Eric Williams," Cornyn said. "This legislation will help keep our communities safe and give federal prosecutors the option to impanel a second jury to decide the ultimate penalty if the first panel cannot reach a unanimous decision." Cruz also said he was "proud" to join the senators to support the legislation, arguing it could prevent future miscarriages of justice. Eric’s Law is based on similar procedures in place in states such as Kentucky, California, and Arizona. This entry was posted in Politics and tagged Crime, John Cornyn, Pat Toomey, Ted Cruz, Tom Cotton. Bookmark the permalink.